BUBBLEMAKER KIDS'BU SCUBA PARTIES A Birthday Party That Will Be Cherished, An Experience Not To Be Forgotten! Celebrate your child's birthday by organizing a party they'll never forget! A Bubblemaker Party is a great idea for a birthday party or any other celebration. A 2 hour experience that will include a briefing about the basics of scuba, taking their first breaths underwater, feeling the weightlessness of water and then lots of fun underwater games. Bubblemaker kids' parties can be held at your pool or at one of our partner pools. Birthday photos, party invites and party treat bags are optional extras. Please give us a call to arrange this special day for your little person. This session is for children aged 8-12 years old. Children use all the basic scuba gear that is supplied by Academy of Scuba - and it's kid-sized so they are comfy. The Bubblemaker crewpak gives kids a memento of their visit to the underwate world and is full of fun surprises. The pack includes: a kid-sized beach towel, log book, certificate, temporary tattoo emblem and the adorable and a popular Bubblemaker "action figure". Adults love them, too. These packs can be purchased for $40 when booking on, just ask our staff. 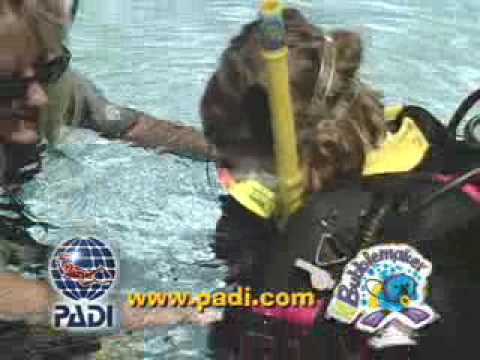 The PADI Bubblemaker program is for children age 8 and above. There is no pre-training required. All parents will need to complete a PADI Bubblemaker Statement prior to any in-water activities commencing. These discovery sessions do not have a fixed schedule, and can be booked on as little a 1 week's notice. Bubblemakers can continue the adventure to complete AquaMissions during the Seal Team program. Those who are 12-14 years old can take the Junior PADI Open Water Diver course and may want to pursue other advanced kids courses.